Check out this book my husband bought me for Christmas! 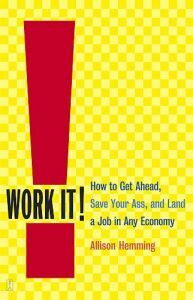 Allison Hemming — founder of the Hired Guns — wrote Work It! as an antidote to the times…times in which an increasing amount of people are losing their jobs, or are at least worrying about the possibility. While the majority of the content in her book is aimed at those in the full-time, corporate work force, I found that the lessons therein — especially as they pertained to resumes, networking, and correspondence — were applicable to anyone looking to make money. And the number one lesson I learned from reading Work It!? It’s never too late to review the basics. Filed Under: book review Tagged With: basics, book, book review, books, correspondence, cover letter, hired guns, interview, interviewing, interviews, networking, resume, work it!